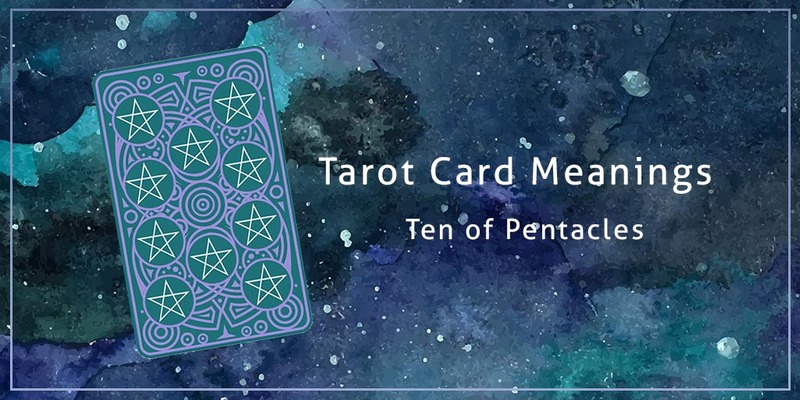 The Ten of Pentacles can be a very interesting card to reveal during a tarot reading, so if this card has come up in a recent reading, why not find out more about what the ten of pentacles could mean for you and your future? Wow! If you’ve recently revealed the ten of pentacles during your tarot reading, then you’re certainly in luck! This card is incredibly positive especially when it comes to wealth and material wishes. All aspects of your life should be going well (or they soon will be!) including in your relationships, health and finances. Make the most of this happiness and fulfilment, but always remember to share what you have achieved – you get back what you give out! As a card of affluence and wealth, the ten of pentacles is great news financially. You are now, or soon will be, free of any money worries or troubles. You will be financially secure and should feel upbeat about the future, so invest in it! Try and save some of this extra money to create a lasting foundation for future success. With this extra cash, you should also help to provide for your loved ones – do they have everything they need? This card is a great sign when it comes to achieving your goals. You may have suffered from many challenges and setbacks along your journey, but you will soon feel incredibly accomplished! You will feel successful and you should certainly be proud of yourself for your achievements. Share your success with those around you for an even bigger boost to your mood, enjoy! The ten of pentacles means plenty of happiness regarding your love life! Currently in a relationship? You and your loved one are about to hit the next level in your relationship. Could a proposal or wedding be on the cards? Could you and your partner move in together? Enjoy this loved up stage. If you’re single, a new love will come in to your life when you least expect it! Any health related news or results you are expecting should be good when the ten of pentacles is revealed. You should be feeling well and in good health for the foreseeable future which will certainly lift your mood. Although the ten of pentacles reversed is generally positive, it serves as a reminder not to gamble or make any unwise, bold decisions. Now is not a good time to take any silly risks! The ten of pentacles advice is to think long and hard about anything important, and to count your blessings. Now is a time to be cautious when it comes to your money. You may have experienced some financial loss or problems with an investment. You can get back on track by making wise decisions and investing very carefully. Be wary of investments or deals that seem good on the surface, only to be much less rewarding than they may first appear. If you are in a relationship and are currently feeling a little bored or unsure of what you really want, this card serves as a reminder to be careful! Think long and hard before making any huge decisions when it comes to you and your partner. If you are single, think about if a relationship is really what you want, or do you simply want some company or something more casual? If it’s love you want, get out and meet new people. Don’t take any risks when it comes to your health, and never take good health for granted! Foolish behaviour such as doing things you know will damage your health should certainly be avoided.